Scrumpy & Western website. Made In Somerset from cider! There are more links on each of the Scrumpy & Western artist pages to unofficial websites, fan sites, other MySpace pages, and other relevant links. These are bands who while not being Scrumpy & Western artists are still worth checking out. Merry Moon - Essex-based band playing a lively blend of English, Irish and American folk with Yetties and Wurzels songs amongst their set. The Fivepenny Piece - Humorous Lancashire band fondly remembered from their heyday in the 1970s; but still going today! Ivor Biggun - official website for this ukulele player and maker of rude records which were all banned by the BBC. Official site for Pensford and nearby villages in North Somerset - home of Acker Bilk and the famous annual festival. Old Scrump's Cider House - an essential guide to all things zider. The Wittenham Hill Cider Portal (aka Andrew Lea's Small Scale Cidermaking pages) give a lot of technical information on all aspects of cider making, including some interesting pages about Andrew's personal experiences as an expert amateur cidermaker, with some useful tips for anyone wanting to make their own. 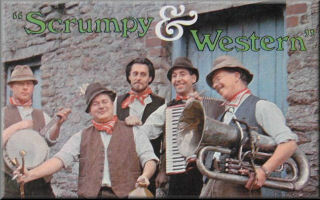 If you're ever over in the Deep South and missing Scrumpy & Western music, tune into Barney Hartline, Jim Hickam, and Terry Wright's show Your Folk Connection on KRCU 90.9 FM in Cape Girardeau, Missouri - they're great fans of The Wurzels, Adge Cutler, Shag Connors and all your other favourite Scrumpy & Western artists, and frequently play their records on air!